Trudy Williams (Artistic Director) and George Boziwick (Curator and Musical Director) bring research to the stage in a set of six programs centered on Emily Dickinson's personal sheet music collection (her "binders' volume" which is in the Houghton Library at Harvard University) that illustrate both the continuity and variety of Dickinson's musical activities within the context of her life and times. Co-authored by George Boziwick and Trudy Williams, each program focuses on a new and insightful element of Dickinson's musical background, all of which served to uniquely inform her emerging poetic voice. An engaging narrative, highlighted with large-screen images of archival artifacts from a variety of sources, is interwoven with selections from her correspondence and poetry, musical performances and theatrical performance uniquely scripted from Dickinson’s own wit and words. These elements combine to bring audiences on an experiential journey that contextualizes fascinating historical, social, and musicological facts, providing new insights into the daily musical life and artistic development of one of America's most beloved poets. Programs include opportunities for audience participation, and conclude with Q & A, often with a guest expert. Program 1: "My Business is to Sing: " Emily Dickinson, Musician and Poet situates Dickinson's daily musical engagements in the context of her talent and her times, along with her encounters with the music-making of the local community, the music of the Dickinson servants, and the New England hymn tradition, all of which payed a vital role in shaping and informing her unique poetic voice. Program 2: "My Wars and laid away in Books - " Emily Dickinson's Music Book: A Prelude to the Civil War takes audiences on a rich journey through the musical engagements, social context and historical events that informed and enlivened Dickinson's poetic voice that was emerging just as our country plunged towards Civil War. Program 3: Emily Dickinson in her Elements: Accomplished Musician, Emerging Poet focuses on Dickinson and her times, tracing the influence of Dickinson's musical engagements on her poetic development within the context of music, nature, Amherst and New England. Program 4: The Musical Parlor of Emily Dickinson introduces audiences to the intimate setting of music-making at the Dickinson Homestead. 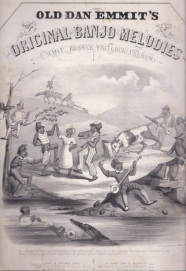 Performances of popular ballads, Irish dance music and minstrel tunes from her bound book of sheet music illustrate how Dickinson and her family collected, listened to and performed the music of her time. Program 5: "Musicians Wrestle everywhere": Sacred and Secular Music in the Poetic Synthesis of Emily Dickinson illuminates Dickinson's journey through the musical, educational, and religious engagements within the context of mid-ninetieth century American liberalism and expansions that helped shape her personalized spirituality that would ultimately assist her in the synthesis of a unique poetic voice. Program 6: Dickinson's Musical Eden: Emily and Lavinia: Music Making in the Homestead presents rarely performed vocal and piano pieces that Emily loved and played from her own collection of sheet music, as well as selections of the popular sentimental songs sung by her sister Lavinia. This program, first presented at the Emily Dickinson Museum, likely marks the first time that many of the pieces have been played directly from the digitized version of the sheet music in Dickinson's own music book. Reading from correspondence illuminates and animates both the music and the musical relationship between the two sisters. reading, and we broke up with a dance - "
Emily Dickinson was an expert improviser at the piano. Friends and neighbors remember her "heavenly music" or her "weird and beautiful melodies all from her own inspiration". Index from Emily Dickinson's music book. "Father seemed perfectly sober when the afternoon train came in and there was no intelligence of you in any way. But "There's a Good Time Coming!" " - how we all loved Jenny Lind." The music performances, narration and theatrical readings are selected from program versions performed in 2012 through 2017 sponsored by: The New York Public Library for the Performing Arts Public Program series at Lincoln Center; the Houghton Library, Harvard, and the American Repertory Theater, Oberon in Cambridge; the Emily Dickinson International Society (EDIS) Conference at Amherst College; The Emily Dickinson Museum, in Amherst, and the Yale Institute of Sacred Music, New Haven. Images of Emily Dickinson's music book courtesy of the Houghton Library, Harvard University; Emily Dickinson daguerreotype courtesy, Archives and Special Collections, Amherst College; portrait of Jenny Lind from The New York Public Library for the Performing Arts, Music Division. "There's a Good Time Coming." Boston: Oliver Ditson,1846. Music Division, The New York Public Library for the Performing Arts. "The Original Old Dan Tucker." Boston: C.H.Keith, 1843. Music Division, The New York Public Library for the Performing Arts.